The Japanese word "kominka" literally means "old house," and the term usually refers to houses built no later than the Second World War. 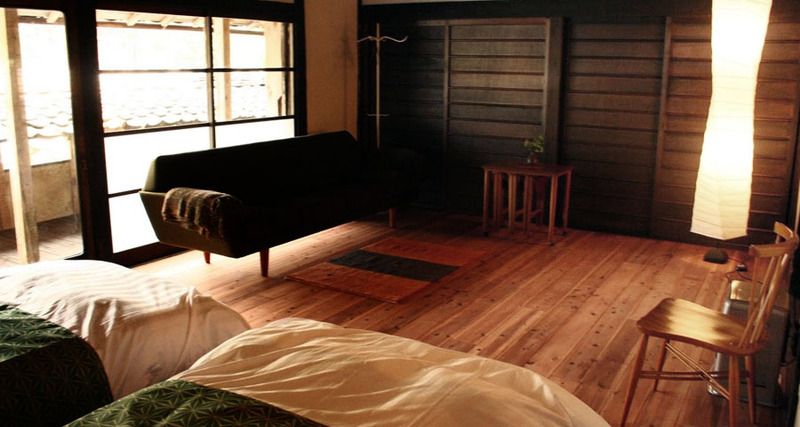 It also usually refers to houses built using traditional Japanese architectural methods, often without using any nails and choosing the type of wood depending on its use. Many are old houses of farmers and are found in small, countryside villages. As a result of its unique architecture and the way it reflects the lifestyle of traditional Japanese farmers, kominka are now considered structures of cultural heritage in Japan. While the architecture of kominka varies depending on the region, there are some common characteristics that can be seen. Firstly, all kominka are made from natural materials. They are made of wood and usually have a thatched roof. In many kominka, you will see huge wooden columns used as supporting pillars. Japanese architecture attempts to use lumber in a natural way, and the grain of the tree is considered part of the art. In addition, different types of trees are used for different parts of the house, for example pine, a strong wood, is used for the beams, and cedar, which has a beautiful grain, is often used for the interior. The floor plan is also unique. At the entrance you will find the “doma,” an area that is the same height as the ground with a dirt or concrete floor. Not only was it used as a transition area between the inside and outside, but as a kitchen and a place to work inside on rainy days. 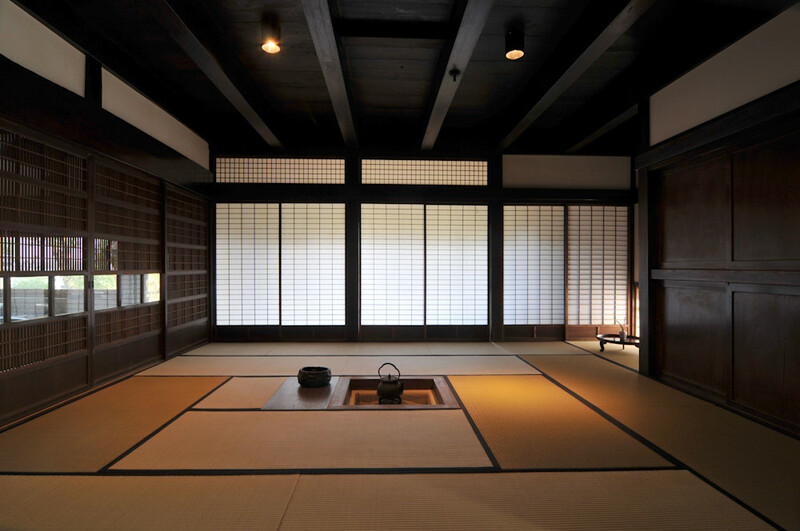 As you enter the side of the house with the raised floor, there is likely to be an “irori” towards the middle of the room. Irori is a traditional sunken hearth, and functions as a source of heat, a place for cooking and drying, and as a place for the family to gather. Japanese houses are traditionally quite small, even in the countryside where there is a lot of land. This is because rooms have multiple purposes. Instead of having a living room, dining room, and bedroom separate, one room serves for all. A room used to have tea with neighbors may be transformed into a place to sleep just by putting out the futon mattresses that were stored away during the day. Sliding doors also make it possible to combine or separate rooms depending on the need. Around the periphery of the house is usually an “engawa”, a narrow corridor like terrace. It is considered neither inside nor outside, and is a great place to relax and observe the outside scenery. Constructed with carefully chosen materials and locally adapted architecture, most kominka are said to last at least 200 to 300 years if maintained properly. Despite the fact that these houses are made to last so long, they are disappearing at a rapid pace. There are many reasons behind this phenomenon, one of the biggest being that fewer people want to live in a kominka. As mentioned before, kominka are usually found in small farming villages in the countryside, and young people prefer to move out to urban areas with more opportunities. In addition to the lack of young people able and willing to taking over a kominka, the cold and dark structure can be depressing especially during the winter. These structures originally built to surround the traditional agrarian lifestyle, do not match the lifestyle of people today. There is also the problem that it costs less to build a brand new house than to renovate an existing kominka. On top of that, the lack of architects with the know-how to restore kominka is also part of this problem. With the lack of people to take care of kominka, there is an increasing number of abandoned houses left especially in the countryside. Yet, the many of the owners of these houses are unwilling to give up their property. In some cases, the owners have passed away without anyone to take over. The problem of the declining population in the countryside combined with the problem of the aging society casts a dark shadow onto the future of kominka. To counter this problem, kominka have been gaining recognition as precious pieces of cultural heritage that reflect some of the core values of Japanese culture. Government efforts to protect areas with traditional architecture have been increasing ever since the 1970s. In addition, local efforts to protect and restore kominka have become more prominent. One example is Maruyama, a small village located in the Tamba-Sasayama area. They renovated three abandoned kominka into a facility for visitors to experience a traditional Japanese lifestyle and nature. Through this project, not only were they able to protect kominka, but also revitalize their village. This was made possible by the support of NOTE, an organization that assists communities in finding new uses for abandoned kominka and revitalize the depopulated areas in an innovative way. TOKI is now part of this project, and lends a hand in introducing guests to the unique experiences offered in the surrounding area. Why not experience a traditional Japanese lifestyle surrounded by nature during your next visit to Japan? Tour through the Sasayama region and discover the architecture movement that's preserving important pieces of the past.